The database login screen looks like this. Your Borrower ID is your student ID (for employees it is your PID). Your PIN is your 4-digit birthdate (MMDD). Choose the type of media and the database you would like to search. 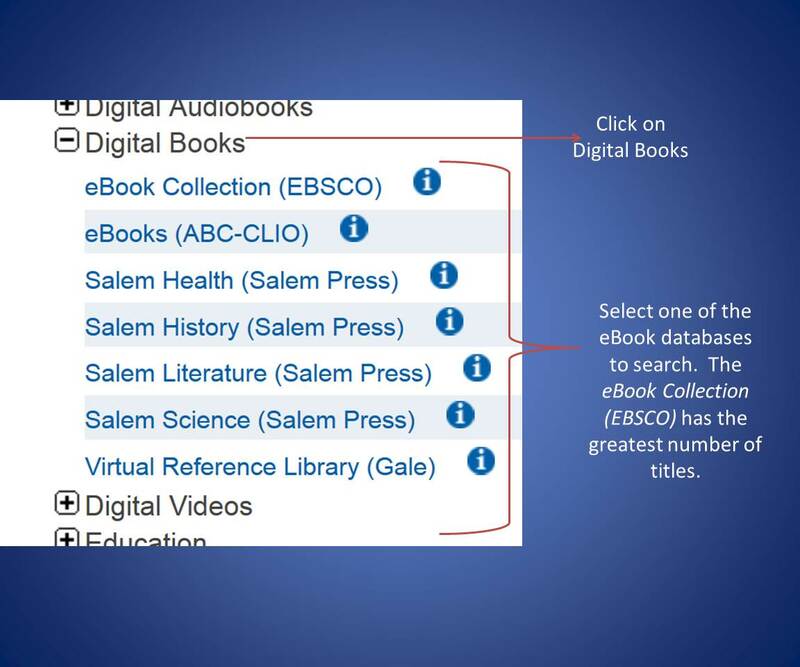 After logging in to the IRSC databases, click on eBook Collection (EBSCO) under Digital Books. Search for eBooks by author, title, subject, or keyword. You can read the eBooks in the browser. In the detailed record for an eBook you can learn about publisher permissions like the ability to print or save pages or copy/paste from an eBook. You can also see the concurrent user level which tells you how many people can view the eBook at the same time. To read the eBook offline on your computer, you will need to download Adobe Digital Editions and authorize it with your Adobe ID. If you do not have an Adobe ID you can create one. Once Adobe Digital Editions is downloaded and authorized, checkout an eBook and download it to read it in the Adobe Digital Editions program rather than the browser. Adobe Digital Editions is free software required for reading EBSCO eBooks offline. Click here to download the Adobe Digital Editions software. Adobe Digital allows you to share eBooks across electronic devices. Find answers to common problems with Adobe Digital Editions Software. These two eBook collections offer full text, free college textbooks.